Meet Campbell! 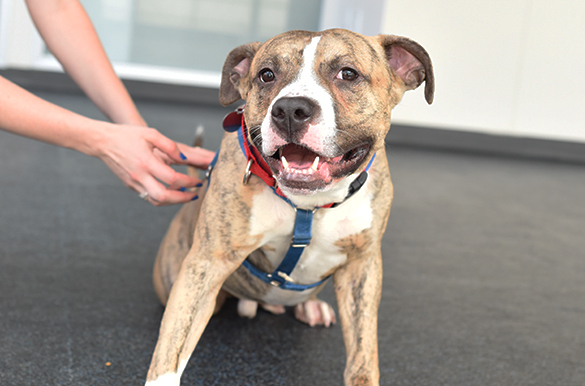 This young pit bull mix has a beautiful brindle coat, and a lot of love to give! Visit Campbell at the ASPCA Adoption Center today. Big fan of: Campbell is a handsome dog who loves most people, but can be a bit frightened of certain objects like large coats and hats, or walkers and canes. Campbell is a curious pup who likes to explore when out for a walk. He enjoys plenty of daily exercise. Not a fan of: Campbell feels nervous when his shoulder is touched, but the Behavior team can show you some exercises to help make him feel more comfortable. Special features: This smart dog already knows “sit”! He is interested in playing with other dogs, and is still learning how to play nicely. Our Behavior team can give you tips for how to introduce new dogs to Campbell, but he is not ready for the dog park. With time and supervision, Campbell will adjust to his new home, and learn to only go to the bathroom outside. 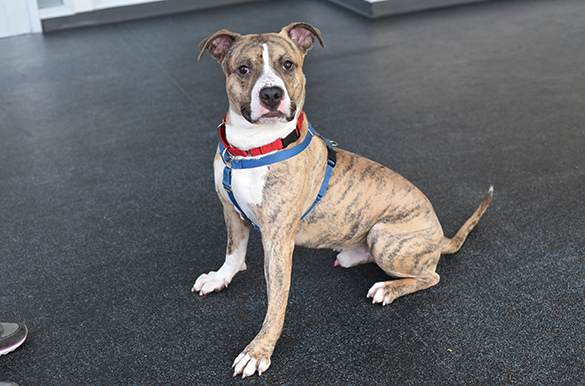 Dream home: This energetic pup is looking for an experienced adopter who can treat him to daily exercise. He would like to join a home with teens-and-up.